Kelly Wyre enjoys reading and writing in all manner of fiction, ranging from horror to romance. She used to work in advertising but is now happily chained to her writing desk and laptop. Kelly relishes the soft and cuddly and the sharp and bloody with equal amounts of enthusiasm. She’s a coffee addict, a workaholic, a chronic night owl, and loves a good thunderstorm. Currently Kelly resides in southeastern United States. 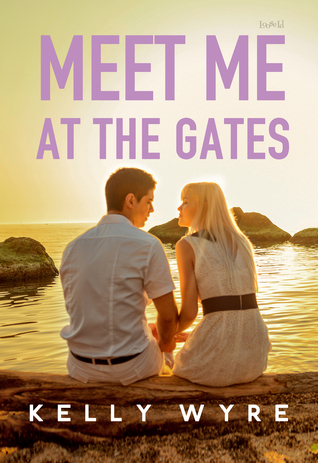 Meet me at the gate is a story about the power of love. It follows the main character Hyacinth and her two friends Lynne and Adir. For most of her life, Hydee has had dreams about past her past lives. In each one, she meets her soul mate and figures how to live with or without him. In the present life, Hydee owns a store in her small community called the Silver Fox. Her soul mate is a successful movie star named Theodore Monk. Hydee tried several times to get close enough to Theo to introduce herself and meet him, but wasn’t successful. As time kept going, Hydee began to lose faith in herself and the dreams. She thought that she wouldn’t be able to reconnect with Theo and it was becoming too much of a strain on her. In a huge cosmic coincidence, Theo runs away from his celebrity life in California and walks into Hydee’s store. Hydee shifts gears to help Theo with his life issues and guide them to love. The two quickly fall into a comfortable habit. They notice how at ease they make each other and how the situation could change. Lynne and Adir keep Hydee grounded as she works things out with Theo. As with nearly everything in life, the good times come to an end. Theo’s girlfriend and assistants find him and throw the entire process off track. By the end of the book and their lifetime, Theo comes to understand the power of love and decision. He states, “[Hydee] Saved my life by showing me that the path to happiness is through my own choices.” I love this statement. In many ways, I feel it was the dominating theme of the story. One thing that I would’ve like to see more of though is character development. Theo was the only person who was flawed and constantly making changes. Hydee seemed to be the one who was relatively perfect. When people in the story learn from their experiences, I grow more attached to them. While the lack of learning didn’t hinder the storyline, it would have made it more compelling for other characters. All-in-all I think this was a great book. The concept of soul mates and reoccurring love was interesting. I connected with both Hydee and Theo on different accounts. While the situation was playing out, I felt a sense of depth and willingness to sacrifice. It’s as powerful idea that few people understand and even fewer experience. Maybe my time will come but until then, Meet Me At The Gate will have to suffice as the love that I strive to achieve. This entry was posted in Words and tagged article, Book Review, Ingrid Hall. Bookmark the permalink.